Home > Blog > Should I Ask for a Jury in my Court Case? When it comes to trying your case, there are several critical procedural decisions that you can make to give yourself an advantage. One of those crucial decisions is whether you should be tried by judge or jury. Under certain circumstances, choosing who hears your case can mean the difference between winning and losing. So, which one is better for you? Before we get going, it is important to remember that this decision should not be made on this blog post alone! Your facts and circumstances are very specific, and an experienced litigation attorney in Phoenix who has both a knowledge of Arizona court proceedings and a strong track record in the courtroom will help you achieve the best outcome possible. A jury trial, often referred to as the heart of the United States judicial system, is a lawful proceeding where a group of individuals (varying in number based on the injury, the court and the jurisdiction) makes findings of fact based on the evidence, testimony, and arguments presented by each side. The findings of fact made by the jury then directs the judge’s administrative actions. For example, after both sides have presented their closing arguments, a judge might instruct a jury that in order to find defendant liable for personal injury damages, the jury must find, by a preponderance of the evidence (meaning more likely than not), that the light was red when the defendant entered the intersection. It is the jury’s duty as “deciders of fact” to follow the judge’s instruction and return with a determination of fact of whether or not the light was red. The judge, as the “decider of law” then decides how the law of negligence should be applied in the case. A bench trial, on the other hand, is a case decided by a judge without the assistance of a jury. In bench trials, the judge takes on a role as moderator, as well as “decider of law” and decider of fact.” In Arizona, unless a jury trial is requested by the plaintiff or defendant, the court will automatically be a bench trial. Let’s return to our personal injury example above. In a bench trial, after both sides have presented their closing arguments, a judge will determine whether or not the light was red when the defendant pulled into the intersection. Once he makes this decision by a preponderance of the evidence, he will apply the appropriate law in determining if the defendant was negligent based on these facts. In civil cases, the preponderance of evidence standard is often more difficult to grasp than the “beyond a reasonable doubt” standard applied in criminal ones. Judges deal with these standards every day and have a strong understanding of how this burden might shift during the arguments made by both sides. For this reason, a jury can be more easily swayed by emotions and irrelevant facts. Additionally, jurors can have preconceived notions that distort their perceived duties as a juror. For example, a juror may be selected and feel duty-bound to help the injured plaintiff receive a favorable verdict despite overwhelming evidence against them. Lastly, juries tend to be better audiences than judges. While judges might base their decision on nuances of law and deep understanding of the law, a jury will be compelled by stories with emotional resonance. Remember, because you will not be the only side persuading the jury, this principle can apply to both sides. Arguably the most significant advantage of a jury, as opposed to a bench trial, is the amount that they tend to award plaintiffs. Personal Injury attorneys know well the advantage they have when they roll the injured plaintiff into the courtroom in a wheelchair. While the judge will likely see through theatrics and sympathies, a jury probably will not. Moreover, juries are sometimes inclined to take from wealthy defendants, corporations, and insurance companies and give to injured plaintiffs. Another strategy a plaintiff or defendant can employ to increase their chances of success is to make the trial as long, expensive, and annoying as possible for the other side. For a defendant with a lot of resources, this might be a great way to try to force a settlement with the opposing party. With more complicated discovery periods, jury selection, and other court proceedings of jury trials, one party may be burdened by the additional cost of a jury. I know, I just called this a disadvantage of bench trials in the section above. The reality is, all of these factors can be advantages or disadvantages based on your specific circumstances. If time is the most important factor for you, then your best bet is probably a bench trial. Judges are familiar with legal proceedings and, let’s face it, they want to make it to lunch on time. This will cut down time by eliminating jury selection and instructions, and minimizing pre-trial motions, which will save you time and money. If, after consulting with your litigation attorney, you find that the relevant law clearly indicates a favorable outcome based on the facts of your case, then a bench trial is probably the best way to go. Judges are fact-oriented and understand the law well, while juries can be unpredictable. When the facts of your case are convoluted and require highly sophisticated legal arguments, a bench trial is likely the best route for you to take. Judges can perform high-level analysis. Juries, on the other hand, may not understand the complicated facts of the case, let alone the legal arguments you are making. Furthermore, as both “decider of fact” and “decider of law,” a judge can decide to take several days to review the facts and arguments presented in court. While a bench trial does not guarantee a favorable verdict, it may increase your chances at a fair trial if the facts and arguments are complicated. Ultimately, there is no golden principle for determining whether a judge or jury is best. Each case is different and requires careful analysis. Making the best decision for your specific facts and circumstances can be extremely complicated and may make or break you. 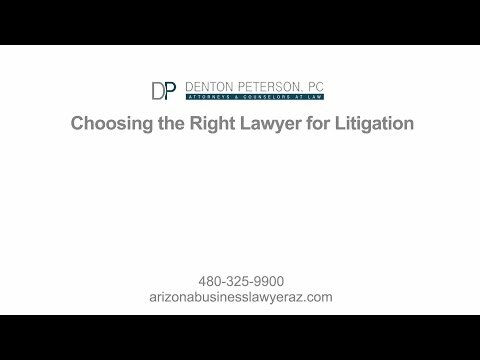 Don’t put yourself at a disadvantage, find the right litigation attorney in Phoenix to handle your case.